Take our globe-trotting tour of NYC’s best sandwiches from Italy's panuozzo to India's pav and more. 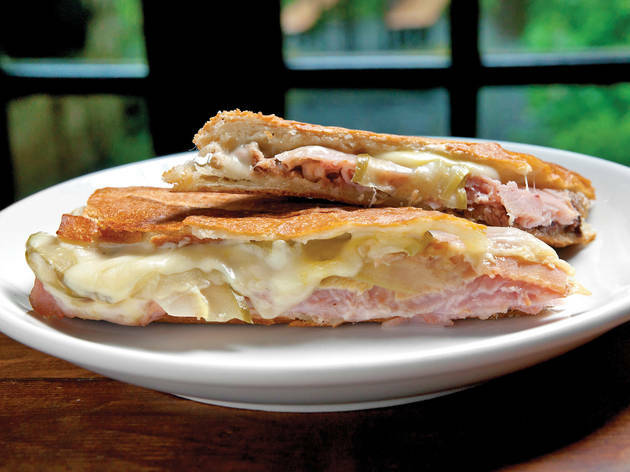 Photograph: Paul WagtouiczBest sandwiches in NYC: CUBA Pig&rsquo;s head Cuban sandwich at the CannibalThe Gramercy spot&rsquo;s snout-to-tail ethos is particularly evident in this pressed, off-cut revision of the Caribbean classic. After a long, leisurely brine in spicy cherry-pepper juice, funky pig&rsquo;s head meat roasts at low heat until it&rsquo;s falling off the bone. 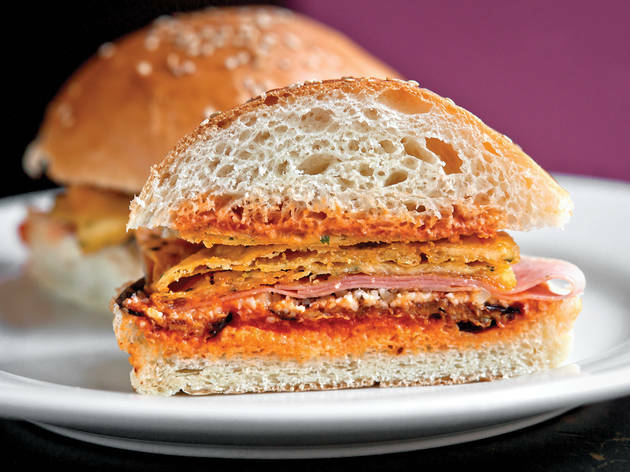 Executive chef Michael Berardino piles the soft slices on a squishy roll&mdash;along with pickles, slivers of ham from Vermont Smoke and Cure and a slick of mayonnaise&mdash;and presses it on the griddle to achieve the Cuban&rsquo;s signature crunchy exterior. 113 E 29th St between Park Ave South and Lexington Aves (212-686-5480, thecannibalnyc.com). $12. 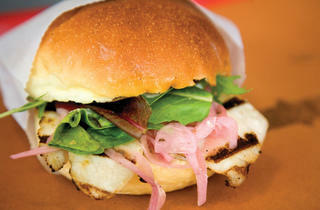 Photograph: Jakob N. LaymanBest sandwiches in NYC: ITALY Ortolano at San Matteo PanuozzoWhen it comes to the Boot&rsquo;s handheld edibles, the panino tends to rack up the most acclaim. 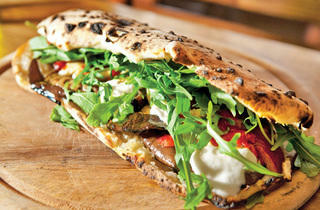 But the panuozzo, a specialty of Salerno that swaps pressed ciabatta for pliant pizza dough, merits equal consideration. 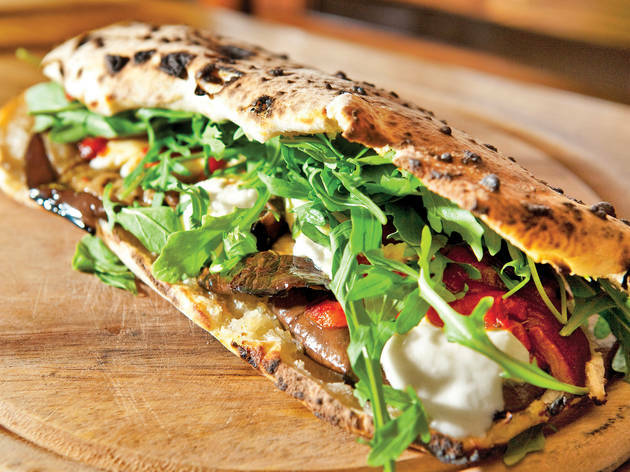 This vegetarian-friendly iteration fills a well-charred oblong loaf with marinated eggplant, roasted red bell peppers, creamy house-made mozzarella and zippy fresh arugula. 127 St. Marks Pl between First Ave and Ave A (212-979-8000, sanmatteonyc.com). $8. 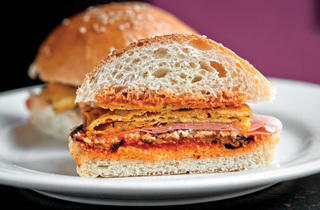 Photograph: Paul WagtouiczBest sandwiches in NYC: ITALY Pane Panelle at Pane PanelleThe namesake creation at this takeout shop is a humble Palermo street snack retrofitted for millennial tastes. Cradled in a soft, seeded Italian bun is a thin chickpea-flour fritter, crisped in a bath of sizzling olive oil and swiped with creamy ricotta and mild stringy caciocavallo cheese. Add on a side of eggplant caponata&mdash;it&rsquo;s Sicily&rsquo;s sweet and pulpy answer to ratatouille. 305 Church St between Lispenard and Walker Sts (212-219-4037, panepanelle.com). $8. 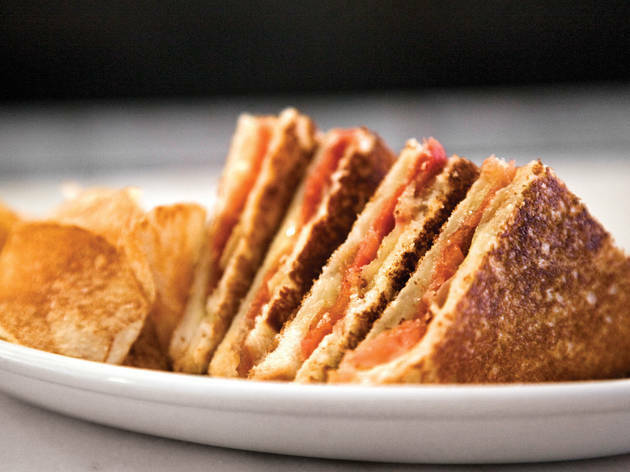 Photograph: Cinzia Reale-CastelloBest sandwiches in NYC: SPAIN Trio bikini at La ChurreriaPopular in Spain&rsquo;s Catalonia region, these diminutive grilled cheeses encase highbrow fillings in lowbrow white-bread toast. 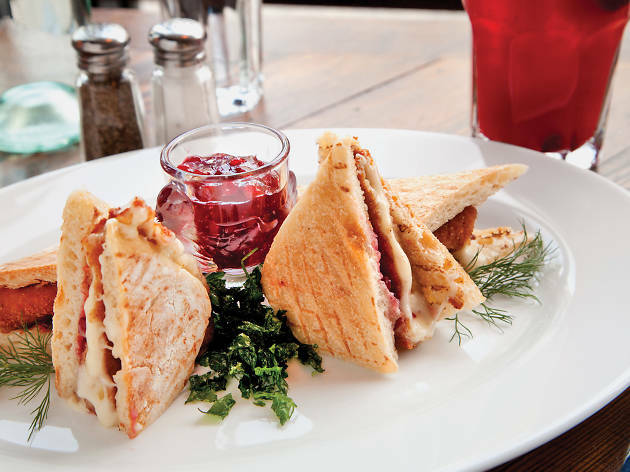 The most authentic variation of the tea-sandwich&ndash;size nibble marries translucent sheets of jam&oacute;n serrano and Mah&oacute;n cheese from the island of Minorca with tangy house-made membrillo (quince paste) for a salty-sweet bite. 284 Mulberry St between E Houston and Prince Sts (212-219-0400, lachurrerianyc.com). $7.50. 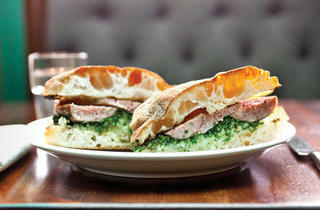 Photograph: Jolie RubenBest sandwiches in NYC: ARGENTINA Pork sausage sandwich at Calyer Chef Gabriel Moya draws on his father&rsquo;s Latin American heritage for this juicy two-hander: House-made porcine links, sliced in half lengthwise, hit the flattop to crisp before being nestled in chimichurri-and-onion&ndash;slicked slices of chewy Brick City Baking bread. 92 Calyer St between Franklin and West Sts, Greenpoint, Brooklyn (347-889-6323, calyerbrooklyn.com). $11. 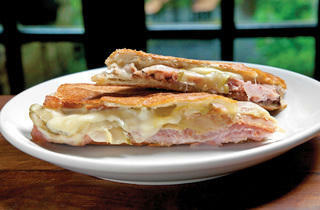 Photograph: Jakob N. LaymanBest sandwiches in NYC: FRANCE AND CUBA Croque se&ntilde;ora at Nights &amp; WeekendsTwo culinary touchstones pop up in this hefty hybrid, which you&rsquo;ll want to attack with a knife and fork. 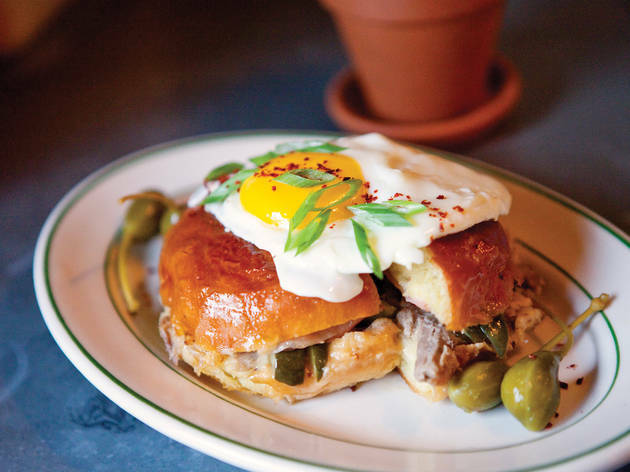 Stacked with a mound of mojo-marinated pork shoulder, chorizo, speck, house-brined spicy pickles and melted Gruy&egrave;re, the sandwich is a play on a Caribbean medianoche&mdash;a near doppelganger for the Cuban sandwich that employs a challah roll. 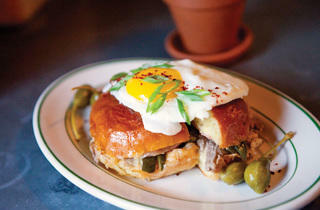 The whole thing is crowned croque-madame&ndash;style with a quivering fried egg. 1 Bedford Ave at Nassau St, Greenpoint, Brooklyn (718-383-5349). $14. 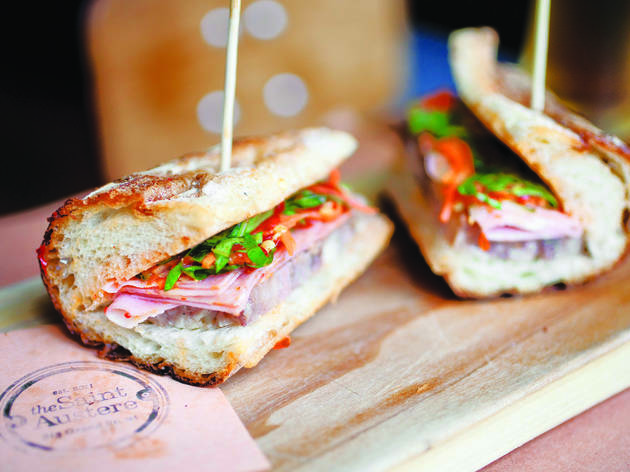 Photograph: Alex StradaBest sandwiches in NYC: VIETNAM AND ITALY Banh Mi[lano] at the Saint AustereAt this democratic wine bar, the Pirolo siblings reinvent the Vietnamese banh mi using Italian cured meats. 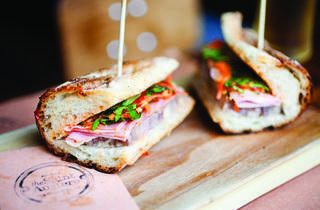 A crusty French baguette, typical for the Southeast Asian sub, serves as the vehicle for testa (headcheese), in place of p&acirc;t&eacute;, and fat-studded mortadella, rather than plain pork cold cuts. Chili paste provides a fiery punch, while cucumbers and carrots add brightness and texture. 613 Grand St between Leonard and Lorimer Sts, Williamsburg, Brooklyn (718-388-0012, thesaintaustere.com). $10. 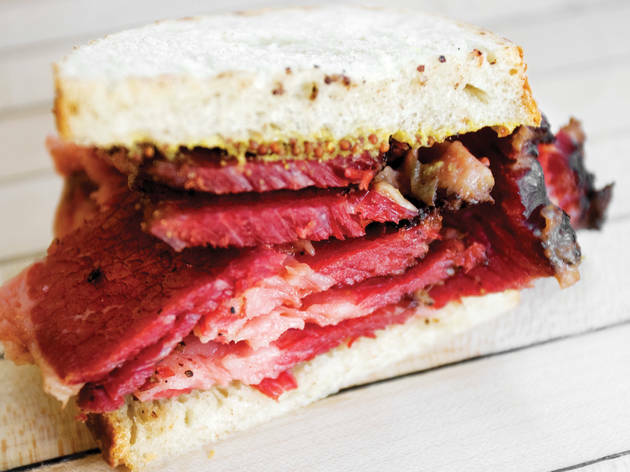 Photograph: Caroline Voagen NelsBest sandwiches in NYC: CANADA Smoked-meat sandwich at Mile EndHusband-and-wife team Noah and Rae Bernamoff took an artisanal approach to the delicatessen traditions of Noah&rsquo;s native Montreal when creating this signature item. Beef brisket rubbed in a house blend of 18 spices (garlic, black peppercorn, coriander, paprika and others) dry-cures for 10 days before taking an eight-hour ride in an oak-burning smoker. Two slices of malty homemade rye, primed with spicy mustard, can barely contain the tender, hand-carved meat. 53 Bond St between Bowery and Lafayette St (212-529-2990) &bull; 97A Hoyt St between Atlantic Ave and Pacific St, Boerum Hill, Brooklyn (718-852-7510) &bull; mileendbrooklyn.com. $12. 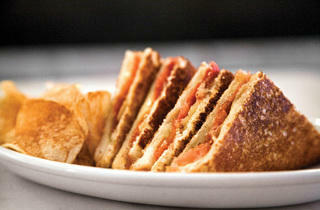 Photograph: Dominic PerriBest sandwiches in NYC: GREECE Thrimatismeno arni se pita at Bouki&eacute;sThink of this petite pocket as the classy Mediterranean version of a sloppy joe. Lamb shoulder sourced from northern Colorado braises and roasts with mirepoix, red wine, garlic and a pantheon of spices. 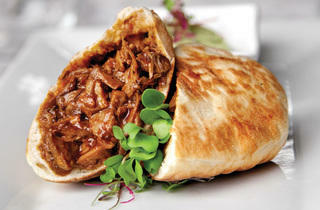 Supple bits of meat are doused with reduced braising liquid before they&rsquo;re stuffed inside a soft pita. To add some tang, apply a scoop of the accompanying mint-flecked yogurt, which gets a subtle zing from the addition of the Moroccan spice ras el hanout. 29 E 2nd St at Second Ave (212-777-2502, boukiesrestaurant.com). $12. 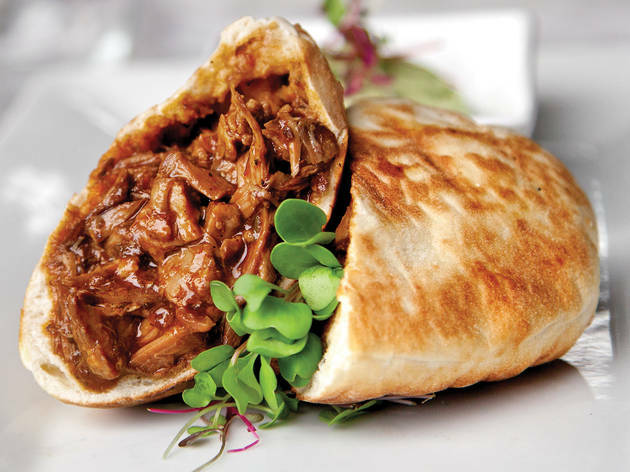 Photograph: Melissa SinclairBest sandwiches in NYC: INDIA Mumbai pav at Desi GalliMix-and-match options abound at this Curry Hill newcomer, but you&rsquo;ll want to focus on the pav section of the menu. 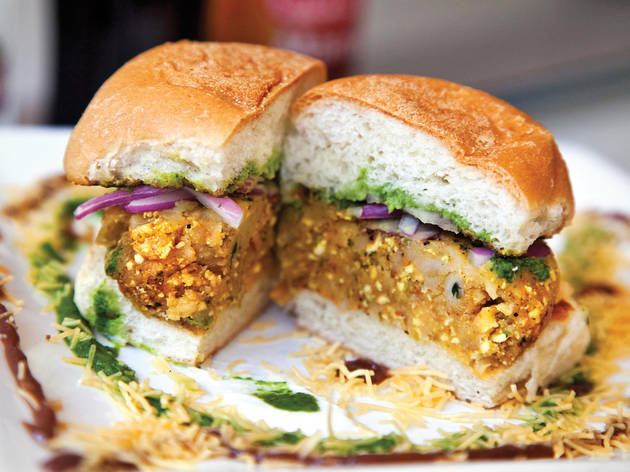 Characteristic of the Maharashtra state in western India, these slider-like buns hold anything from chicken tikka to our favorite&mdash;dense patties made from cumin-laced potatoes and grated paneer (a firm Indian cheese). 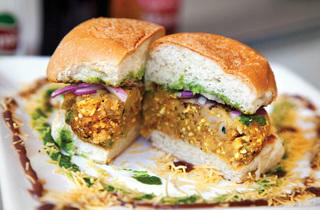 Skip the tamarind and mint chutneys on the side; the fillings are best left unadulterated. 101 Lexington Ave between 27th and 28th Sts (212-683-2292, desi-galli.com). $2.99&ndash;$3.99. 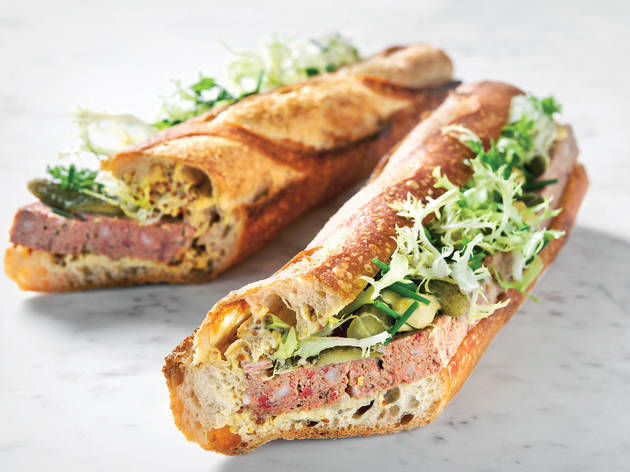 Photograph: Paul WagtouiczBest sandwiches in NYC: FRANCE P&acirc;t&eacute; de Campagne at &Eacute;picerie BouludBoulud&rsquo;s upscale deli brings rustic French flavors to bear upon this classic sandwich. Master baker Mark Fiorentino delivers its yeasty foundation&mdash;a chewy whole-wheat baguette. 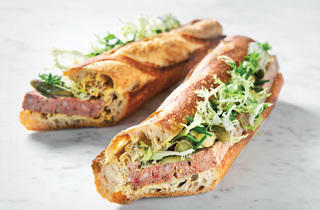 To that crusty torpedo, staffers add burly slabs of coarse, house-made pork and chicken liver p&acirc;t&eacute;, plus briny cornichons, bitter fris&eacute;e and a zingy blend of Dijon, whole-grain and Orl&eacute;ans mustards to cut the richness. 1900 Broadway at 64th St (212-595-9606, epicerieboulud.com). $7.50. 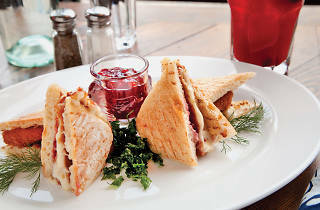 Photograph: Dominic PerriBest sandwiches in NYC: CZECH REPUBLIC Grilled Camembert at Doma na rohuChef Arpad Galvacs reimagines the ubiquitous Czech beer snack smazeny syr (fried breaded cheese) as a grilled cheese sandwich at this Austro-Hungarian caf&eacute;. Golden fried fingers of earthy Camembert ooze onto a chewy ciabatta&mdash;their molten flow trapping the lacy shreds of fried parsley sprinkled on top. A Mitteleuropa kick comes by way of imported German lingonberries, whose burst-in-the-mouth juices provide a sweet-tart complement to the pungent rind. 27 1/2 Morton St at Seventh Ave South (212-929-4339, domanyc.com). $9. Photograph: Dominic PerriBest sandwiches in NYC: TURKEY Wrap at CigkoftemThis intriguing wrap offers a raw and vegan-friendly version of cig kofte&mdash;a traditional Turkish tartare of chilled lamb or beef. To make this meatless version, a lengthy list of ingredients&mdash;including bulgur wheat, walnuts, cumin and plenty of hot pepper&mdash;are finely ground, bound together with tomato paste and flattened into moist patties. The hearty kofte is paired with a dicing of sweet tomato, crunchy cucumber and parsley, plus a drizzle of lemon and pomegranate juices, all contained in a resilient lavash wrap. 438 E 9th St between First Ave and Ave A (212-777-8767, cigkoftem.com). $4.85. 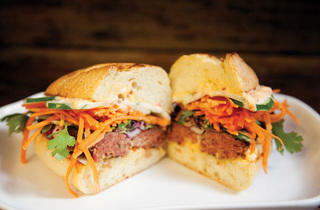 Photograph: Melissa SinclairBest sandwiches in NYC: CAMBODIA Grilled Khmer sausage at Num PangNum Pang&rsquo;s fragrant, fatty sausage sandwich provides a bright survey of Cambodian flavors. 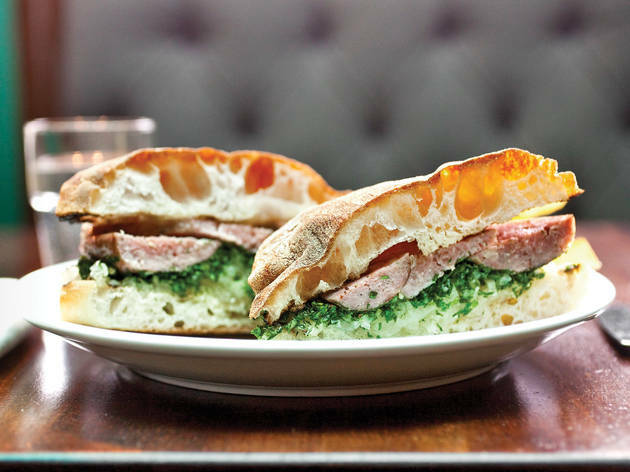 A pair of lightly charred pork bangers, hot and herbaceous, with red Thai chilies, fresh mint and cilantro, are loaded onto a garlic-toasted semolina baguette. They&rsquo;re crowned with a tangle of sweetly pickled carrots, fresh cucumber and more aromatic cilantro, which help balance the sausage&rsquo;s smokiness. A dab of chili-kicked mayo adds extra heat to the heady mix. 140 E 41st St between Lexington and Third Aves (212-867-8889, numpangnyc.com). $7.50. 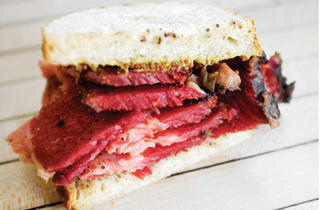 Among the best sandwiches in New York rank the Reuben, the meatball sub and the roast beef on a roll. 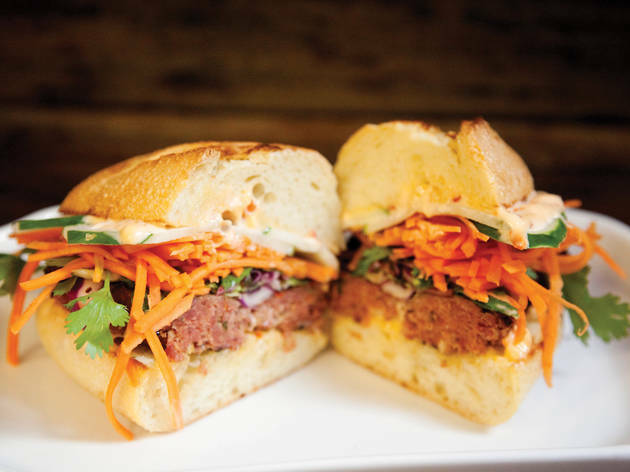 But a set of new international sandwiches have arrived in NYC. Here, we take a look at the best sandwiches with global flavors—including the Mexican torta, the Italian pane panelle and the Spanish bikini—popping up around town.